My kids take SO long to get ready in the morning for school! OMG, it drives me nuts. Most of the time, my daughter is dilly-dallying while trying to pick out her clothes to wear. And my son? Oh goodness. If I let him pick out his clothes, he’d just grab the first two things he saw. He honestly does not care. 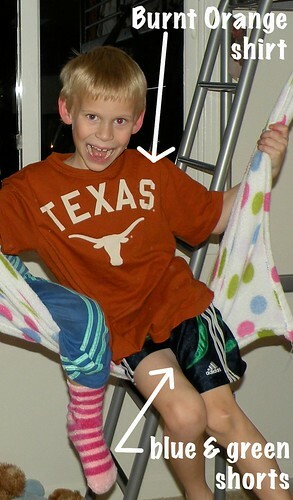 His favorite combination is to wear his burnt orange shirt with pumpkin orange or red shorts. It hurts my eyes. How did I solve this dilemma? I bought a hanging shelf divider for each of their closets. Every Sunday I pick out five outfits for the following week. Then I stuff each outfit in a pocket. I even include the underwear and socks. I was going to label each pocket with a different day of the week, but they wanted the option to pick out which outfit they will wear each day. I’ll probably just leave it as is for now. Now we’ve got one less thing to stress about when we are in a rush each morning. My diva daughter even loves this. I was afraid she’d revolt, but she loves just rolling out of bed and grabbing a stack of cutely matched clothes for the day. I let her decide how to do her hair and what bow to wear, so she’s a happy camper. Mornings are so much less stressful now for us. They get dressed so quickly AND they look cute and match. They’re happy and Momma’s happy. Do you have any tricks that you do to help your mornings go more smoothly? That is a good idea. I actually remember my aunt doing that for my cousin when I was little, but she just folded the clothes together. I love this idea. I might have to copy you…except I don’t think there is room in their closets for the hanger thing, so I will have to find a different way to store them. He’s used to being BEHIND the camera, where fashion doesn’t matter – not in front of it! C’mon Mom…give a videographer a break! OMG, haha, I just spewed my Diet Dr Pepper. Thanks so much for that! You are so right. Wow! Great idea!!!! If you get a chance come enter my giveaway! I’ve tried this, my daughter will not allow it. She wants final say in her wardrobe or she will wear 2 clashing patterned pieces. We at least decide the night before. Great idea! Saw this linked from Thrifty Decor Chick. Yes! Pack 4 lunches the night before and put in fridge! One of those is mine bye the way…mommy’s not crabby anymore! What a great idea!! I am sure it saves the wear and tear on your nerves as well!! I have a lot of painting supplies; ie., brushes, inks, stamps, glues, etc., etc. I bought an over the door clear vinyl shoe caddy and I put all my paraphernalia in each pocket. I can see at a glance what I am looking for and it keeps all these small items organized and out of the way. I have hung the vinyl shoe rack in my studio on a back wall…out of the way! So cool!! We did the same exact thing for school this year! I got one of these organizers in the cheap bin at Target and it has worked wonders! We pick out the outfits on Sunday night. It makes getting ready for school much smoother! I’m so glad my kids aren’t the only ones who mismatch dress. My 2 boys are in an orange shorts phase. Must wear orange shorts every day. They don’t have enough shirts to match them so often times they are wearing orange shorts with green shirts. Oh. Boys. What a wonderful idea! We don’t have kids…yet…but I’m gonna keep this idea for when we do! 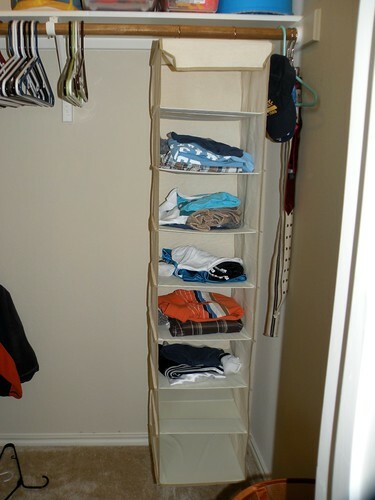 We do something similar, but it takes up less closet space. 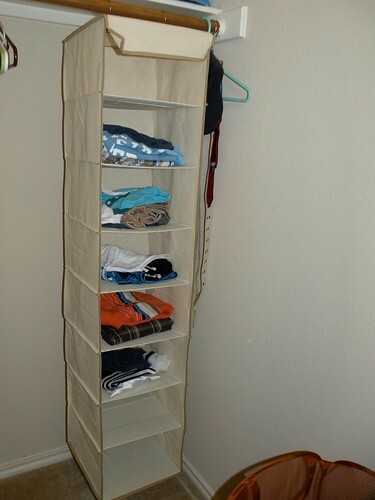 We have closet dividers to neatly divide the closet by type of clothing (short sleeve, long sleeve, etc.) Each Sunday, we will look at the weather and schedules to choose clothing for each day. I use the laminated hang tags to label each day’s attire and leave each set of clothing on 1 hanger. I hang them in order on the closet rod. I just pull out the next day’s clothing before the kids go to bed and hang them on a hook. I found a fantastic idea (I *think* it was in Real Simple), and I hung a full length mirror in each child’s closet. I bought four 3M removable hooks for each closet, and hung 2 at shoulder height and 2 at waist height for each child. 2 pieces of string to hang across the mirror and tie to the hooks like “clotheslines” for the “bottoms” and the “tops.” This means they can “try on” clothes without destroying their closets. I also bought clear acrylic boxes and attached them to the closet door next to the mirrors to hold accessories. Now, mornings should be much easier! Haha! My son dresses the same way then add the cowboy boots to the shorts to top it off. LOL!!! I like this idea alot! Hey Allison, visiting from Cheri’s again. Aww, your kids are so cute. 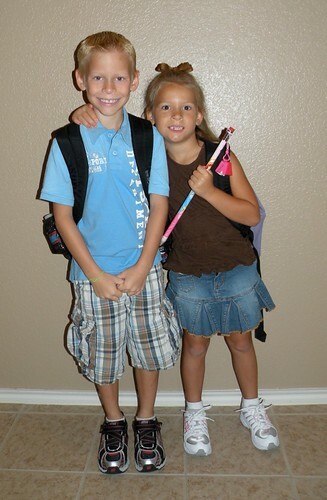 Yeah, I have to dress my boys for school too. Who knows what they would wear. I do this for my five year old son too! That is a great idea. I do the clothes hanger with the days of the week on it, but I think this keeps EVERYTHING together so much better! Thanks for linking with What are little boys made of? Great idea! I set out an outfit on The Boy’s desk the night before that matches so he can just put it on in the morning. I don’t have kids, but this is such a great idea!! I’ll have to put it in my memory bank for the day I actually DO have little ones! That is a wonderful idea! I wish my mom would have done this for me, haha. This is a great idea! 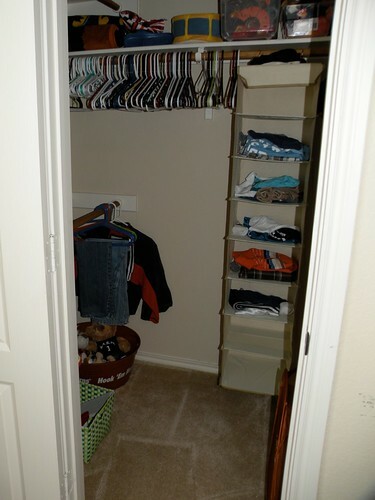 I wish I had this much space in my little kids closet! Visiting from Get Your Craft On link party. 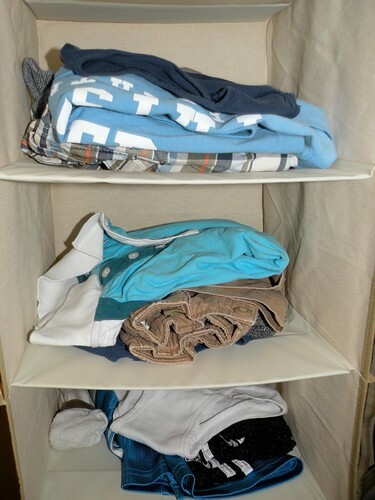 Great way to get your son organized and streamline the morning rush. It’s nice that Momma is watching out for her son and keeping him and his clashing clothing from making it out the door! Thanks again for linking up to A Crafty Soiree! I appreciate all your links! Great idea! Thanks for linking it up! Gotta love anything that helps you to get out the door in the morning! I have some routines that help us, as well.